I love modern libraries, especially the children’s section. Because it’s not all about keeping the peace anymore, but about fostering the love of books and learning. Gone are the bad old days of musty books and foreboding quiet corridors, the stereotypical spinster librarian hissing “SSSHHH!” if you so much as thumbed the pages too vigorously. Our local library has a wonderful children’s section with new books, touchscreen activities, and a generous stage and play area where babies and children can romp and read with their parents and carers. I keep forgetting that we have this wonderful resource a mere 15 minutes pram-ride from our home. And I’m so glad I remembered it this week. When Arddun and I were feeling better one afternoon after lunch, both of us took a leisurely stroll and spent the hour before her nap time reading books and hanging out with the other kids. And she, social animal that she is, was just rapt with the amount of activity around her. Anyhoo – Mother’s Day is around the corner, and we just happened to pick up a storybook about a little girl who goes shopping for her Mother’s Day gift. And I had expected something along the lines of the protagonist buying her mother Coco Pops instead of Coco Chanel, concocting homemade perfume out of squished up dandelions, and making a complete hash out of the greeting card and the stationery cupboard. Apparently, this author has other ideas. Yes, Arddun. 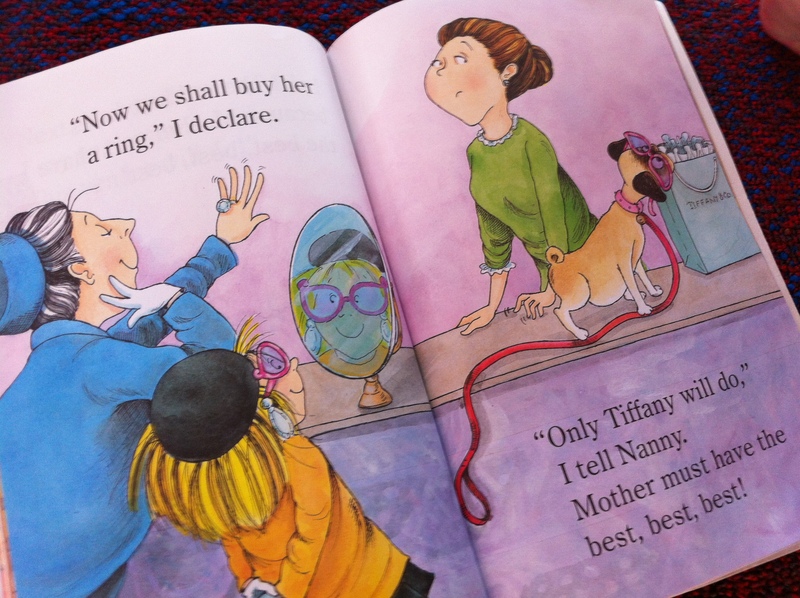 Tell Daddy that only Tiffany will do. She also went to Godiva for chocolates in the page before her visit to Tiffany & Co. The lady in blue is her nanny. I kid you not. Yes, we do live on the Upper East Side of Canberra… and that’s where the similarities end.